Dark grey rocks emerged in vague detail, one angular boulder jutting centre stage between the rounded curves of enormous granite slabs. 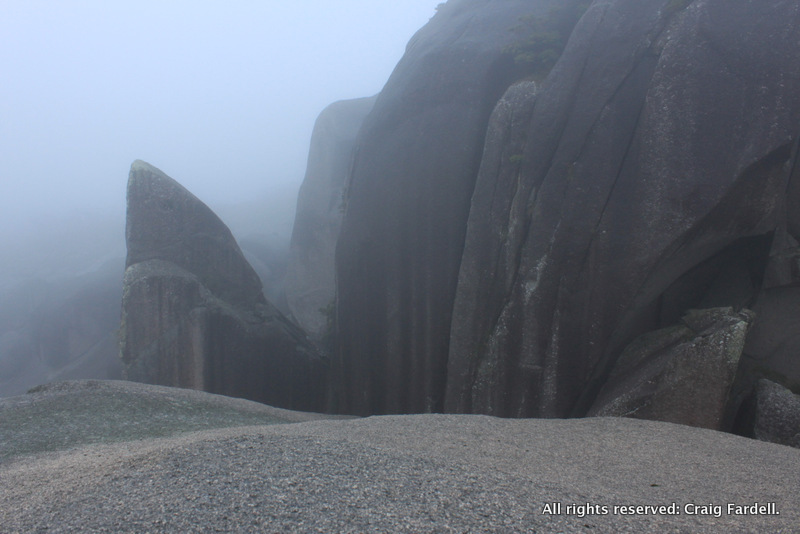 Glimpsed through a distorting veil of thick fog, the rocks were streaked with wet and the scenery felt like a mystery to be solved. Some trips are all about mood. The tent and the campsite is a home away from home, even if just for one night. It’s nice when a campsite comes up with the goods – million dollar views or beautiful forest, soft ground, water, the right feng shui. That’s not always possible. Sometimes we are left searching out a patch of clear ground between too many trees or pitching on a tiny edge of river bed too close for comfort to the rising water. However, more often than not, nature comes up with the goods and we have had some truly stunning campsites. So, with a new year now in swing and new adventures ahead of us we thought we’d quickly share some of our best campsites of 2012.